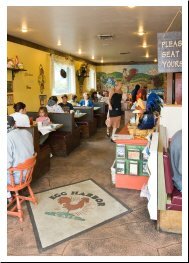 The Egg River Cafe has been a family favorite for more than 10 years. We try to evoke the feeling of traditional, warm-hearted family meal with its cozy, country decor, large portions and a long menu to choose from. Our business is based on the basic principles of making great food - using fresh, seasonal, whenever possible - local ingredients. We make pancakes from the scratch, offer real maple syrup and make our own hashbrowned potatoes and home fried potatoes from the real thing-- not from the frozen stuff... We are just downright proud of our good homecooked food. So please come and visit us for breakfast or lunch. Both are eggceptional!